Cool review. Wonder if one could maybe slip a foam handlebar grip (or something similar) over the handle? Something easy to replace, as it’d probably get pretty nasty after a while. Hey Earl, thanks for stopping by man. You might be able to slip something over the handle. I have been meaning to wrap mine with some tennis racket grip tape. Good and accurate review. 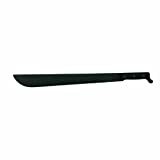 I have owned and used this model of machete, and I agree that the weight of this model can be tiring after a long period of use. I believe that Ontario also offers lighter camper models that are not as tick and heavy. Thanks, Faiaoga. I have not delved to deeply into Ontario’s machete line up, but a lighter model would probably be a very good idea in some situations. I don’t mind the weight, but I am not spending my days carving through the jungle either! Great review. I know this is from several years ago, but both products are still available on amazon, and though I didn’t go check apparently Walmart carries this 6145 for the same price ($18.85), so if you can’t wait for shipping you can pick up in store. This machete makes quick work of stripping the husk off of coconuts. A sharp tip would help to get the final puncture into the flesh to let the coconut water flow out, but the rounded tip is good enough. Question: How did you remove the “stock belt clip” from the sheath? I found that the machete blade is too wide to slide into the sheath with the rivet in place. Did you just pry it off? How did you avoid damaging anything? Thanks for the comment. Although the review is a few years old, and probably due for an update, I still have the knife and it’s still as good as ever. I agree, a sharp tip can be useful, but you have to be careful with it (obviously). Can’t say I have husked too many coconuts with mine – even in S Florida. If I recall correctly, I used a hacksaw and also pried off the belt clip. It took some time. Go slow to avoid damaging anything. Good luck! The handle material is easy to whittle with a sharp knife. I whittled in some finger grooves for a better grip. The best way to sharpen it is with a flat file. Hold the file about 45 degrees to the blade while running the file down the length of the blade. Easy to cut a finger severely doingthat if you aren’t careful. Much better camping tool than a hatchet. I have an Ontario 18″ machete and a issued military plastic sheath the issue is when I put the machete in all the way I can hardly get it out. It is like stuck down near the bottom of the sheath. Any suggestions on how to resolve this issue ?? Maybe you can try heating the sheath up a little with a hair dryer or heat gun? I wonder what is causing it to bind up? I had thought about trying that. It has a manufacture date of 1967 on it and wonder if today’s machete is made a little thicker than back during the Vietnam war .